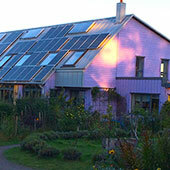 Numerous homes and community buildings incorporate solar panels for hot water heating. A community company supplies panels to residential and commercial customers throughout the UK, both for new buildings and to retrofit existing buildings. Most new community buildings incorporate design features that invite passive solar radiation to reduce building heating needs, such as south-facing windows and conservatories and minimal wall openings on north walls. Sustainably harvested wood provides space heating for both new and older homes. Our four community-owned wind turbines, which have a total capacity of 750kW, supply more than 100% of the community's electricity needs. Our system is unusual in that the community owns its own private electricity grid, the main campus having originally been a private caravan park.The electricity produced by the turbines is sent to a substation that meters the flows, alters the transmission voltages and acts as a switching station. When the wind blows the electricity is used on-site. If production exceeds demand the surplus is exported to the grid. If the wind does not blow the site imports from the grid. Overall we are net exporters of electricity. 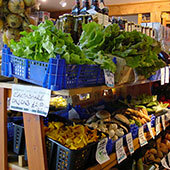 Green electricity generation is one of our successful community businesses. The guidelines for new buildings in the ecovillage encourage very high levels of insulation and double- or triple-glazed windows with low-emission window coatings. Architects are encouraged to incorporate energy efficiency considerations into every building design. Energy efficient compact fluorescent light bulbs are installed in many residences, businesses and community buildings. The ecovillage is a test case for a research project on the feasibility of using load management technology, which is equipment that helps match the electricity output of the wind turbines with the electricity requirements of community homes and businesses Energy running costs for newer houses are many times less than the running costs for the original old caravans. Over the years we have developed our own sustainably harvested woodland generating circa 26 tons of firewood a year. Increased use of wood for space and water heating has gradually eliminated the use of coal, and where possible a shift has been to propane instead of oil, as the less polluting option. 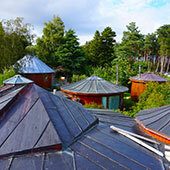 Using solar, wind and wood, combined with highly energy-efficient features in our new buildings, the Findhorn ecovillage now receives 28% of its total non-transportation energy from renewable sources. We expect to increase this percentage as caravans are gradually replaced with energy-efficient new houses. Our wind energy project started in 1989 when we erected a Vestas V17 75 kW wind turbine. 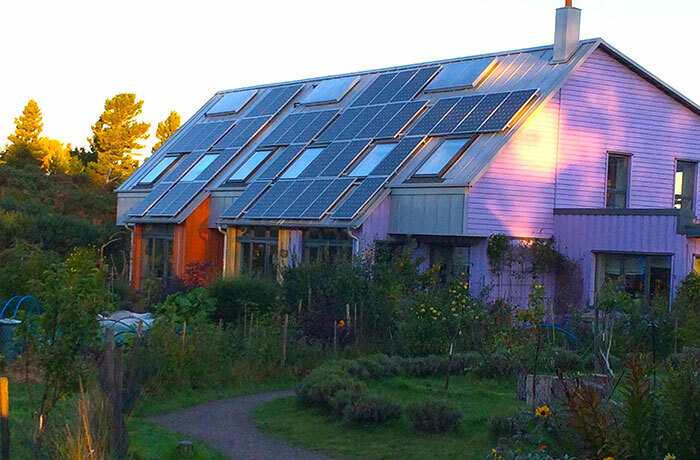 This turbine, named Moya after the Sesotho word for 'wind and spirit', has been extremely successful and reliable, providing about 20% of the electricity needs of the Findhorn Ecovillage. 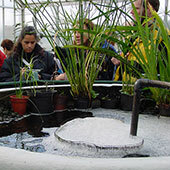 This initial phase was financially successful, repaying the initial investment of £75,000 in approximately five years. We have now erected three additional second-hand Vestas V29 turbines ('The Three Graces'), each capable of delivering 225kW and giving a total installed capacity of 750 kW. With support from the Scottish Community and Householder Renewable Initiative, our planning application was submitted in June 2004, and we received a planning permit in January 2005 after a public hearing. 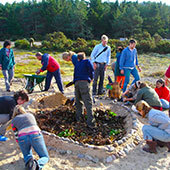 The expansion undertaken by Findhorn Wind Park Ltd has cost £605,000. The project investment came from NFD Ltd (which operated the original turbine), Ekopia Ltd (our development trust) and Caledonia Renewable Energy Co-operative, which is part of the Energy4All group. Construction was completed by DMH Blacksmiths of Inverness in January 2006 and commissioning was completed in the following March. These additional turbines make us net exporters of electricity. About 50% of the electricity produced is used on-site via our private grid, and the remainder is distributed to the main grid. Research into the potential for the production and use of hydrogen fuel cells is something we are currently exploring. In a recent study of the community's current energy consumption, we found we are now using renewable energy for about 28% of our needs. This takes into account the element of hydropower in our current mains supply as well as our own wind turbines' production, the use of firewood for backup and primary heating, and the elements of active and passive solar design in new buildings. The balance still comes largely from fossil fuels. 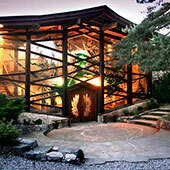 Our goal is to continue to increase the percentage of our ecovillage's energy needs produced from renewable sources. In 2006 an independent study by the Stockholm Environment Institute concluded that the residents have the lowest ecological footprint of any community measured so far in the industrialised world and are also half of the UK average, The study found that residents of The Park and the nearby campus of Cluny Hill College have, on average, a footprint of 2.71 hectares per capita, a little over half the UK national average of 5.4 hectares. Of particular significance are the results relating to food, ‘home and energy' use, and 'consumables and personal possessions' which have 35%, 27% and 44% of the national average respectively.